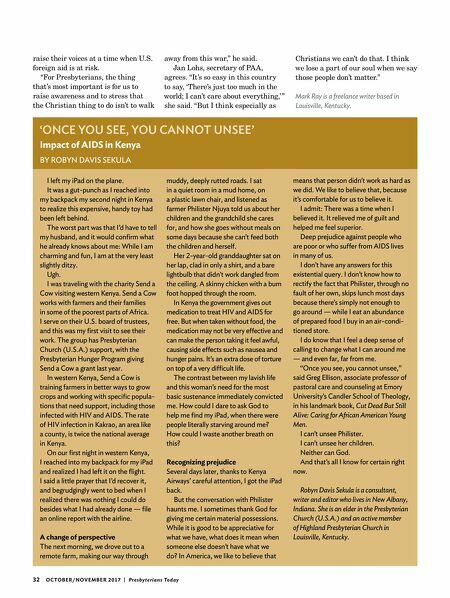 32 OCTOBER/NOVEMBER 2017 | Pr e s by te r i a n s To d ay 'ONCE YOU SEE, YOU CANNOT UNSEE' Impact of AIDS in Kenya BY ROBYN DAVIS SEKULA I left my iPad on the plane. It was a gut-punch as I reached into my backpack my second night in Kenya to realize this expensive, handy toy had been left behind. The worst part was that I'd have to tell my husband, and it would confirm what he already knows about me: While I am charming and fun, I am at the very least slightly ditzy. Ugh. I was traveling with the charity Send a Cow visiting western Kenya. Send a Cow works with farmers and their families in some of the poorest parts of Africa. I serve on their U.S. board of trustees, and this was my first visit to see their work. The group has Presbyterian Church (U.S.A.) support, with the Presbyterian Hunger Program giving Send a Cow a grant last year. In western Kenya, Send a Cow is training farmers in better ways to grow crops and working with specific popula- tions that need support, including those infected with HIV and AIDS. The rate of HIV infection in Kakrao, an area like a county, is twice the national average in Kenya. On our first night in western Kenya, I reached into my backpack for my iPad and realized I had left it on the flight. I said a little prayer that I'd recover it, and begrudgingly went to bed when I realized there was nothing I could do besides what I had already done — file an online report with the airline. A change of perspective The next morning, we drove out to a remote farm, making our way through muddy, deeply rutted roads. I sat in a quiet room in a mud home, on a plastic lawn chair, and listened as farmer Philister Njuya told us about her children and the grandchild she cares for, and how she goes without meals on some days because she can't feed both the children and herself. Her 2-year-old granddaughter sat on her lap, clad in only a shirt, and a bare lightbulb that didn't work dangled from the ceiling. A skinny chicken with a bum foot hopped through the room. In Kenya the government gives out medication to treat HIV and AIDS for free. But when taken without food, the medication may not be very effective and can make the person taking it feel awful, causing side effects such as nausea and hunger pains. It's an extra dose of torture on top of a very difficult life. The contrast between my lavish life and this woman's need for the most basic sustenance immediately convicted me. How could I dare to ask God to help me find my iPad, when there were people literally starving around me? How could I waste another breath on this? Recognizing prejudice Several days later, thanks to Kenya Airways' careful attention, I got the iPad back. But the conversation with Philister haunts me. I sometimes thank God for giving me certain material possessions. While it is good to be appreciative for what we have, what does it mean when someone else doesn't have what we do? In America, we like to believe that means that person didn't work as hard as we did. We like to believe that, because it's comfortable for us to believe it. I admit: There was a time when I believed it. It relieved me of guilt and helped me feel superior. Deep prejudice against people who are poor or who suffer from AIDS lives in many of us. I don't have any answers for this existential query. I don't know how to rectify the fact that Philister, through no fault of her own, skips lunch most days because there's simply not enough to go around — while I eat an abundance of prepared food I buy in an air-condi- tioned store. I do know that I feel a deep sense of calling to change what I can around me — and even far, far from me. "Once you see, you cannot unsee," said Greg Ellison, associate professor of pastoral care and counseling at Emory University's Candler School of Theology, in his landmark book, Cut Dead But Still Alive: Caring for African American Young Men. I can't unsee Philister. I can't unsee her children. Neither can God. And that's all I know for certain right now. Robyn Davis Sekula is a consultant, writer and editor who lives in New Albany, Indiana. 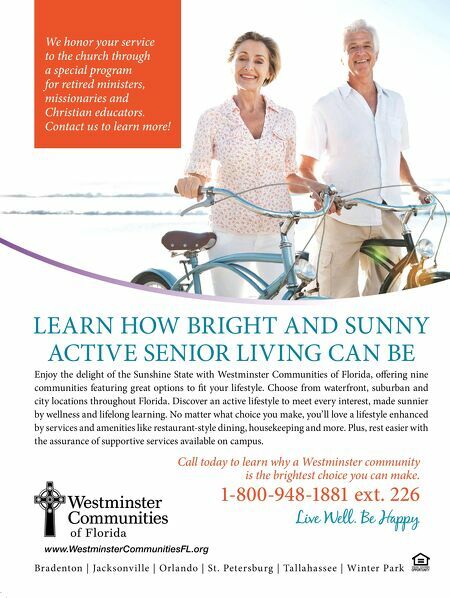 She is an elder in the Presbyterian Church (U.S.A.) and an active member of Highland Presbyterian Church in Louisville, Kentucky. raise their voices at a time when U.S. foreign aid is at risk. "For Presbyterians, the thing that's most important is for us to raise awareness and to stress that the Christian thing to do isn't to walk away from this war," he said. Jan Lohs, secretary of PAA, agrees. "It's so easy in this country to say, 'There's just too much in the world; I can't care about everything,' " she said. "But I think especially as Christians we can't do that. I think we lose a part of our soul when we say those people don't matter." Mark Ray is a freelance writer based in Louisville, Kentucky.